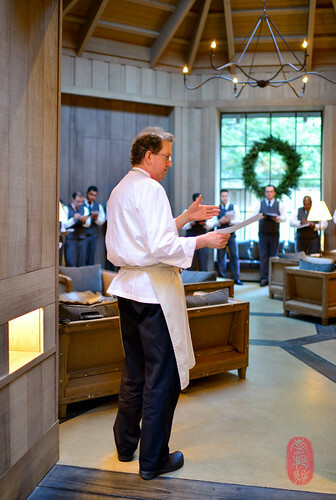 Chef Tim Cushman brought with him to the Twelve Days of Christmas at The Restaurant at Meadowood a menagerie of chopstick holders (ranging from dogs and cats to red hot chili peppers and pigs flying planes) and a whole lot of flavor. Cushman is the only chef of this year’s Twelve Days of Christmas guest chefs whose restaurant I had not visited, and whose food I had not had. When asked to describe the food he cooks at O Ya in Boston, he told me that it’s inspired by Japanese cuisine (like Andy Ricker, he shies from the word “authentic”). Much of it, like the food he served last night – the fourth dinner of the 2013 Twelve Days of Christmas – he presents as single, nigiri-like bites that aim to deliver a composed group of flavors. Cushman kicked off the dinner with a set of four nigiri canapés, each a flavor-packed bite on sushi rice, a 50/50 blend of two different California koshi hikari grains. My favorite one perched a tempura-fried kumomoto oyster on a round of sushi rice with yuzu kosho, dash mayonnaise, and Tokyo leeks. He also presented the first three courses, all one-bite composition. In rapid succession: a kumomoto oyster on the half-shell, with marinated melon mignonette; a sliver of shima aji with sea urchin, white soy, and coriander; and a lovely slice of hamachi dressed with a fiery “Viet mignonette” that, I thought, paired especially well with the Checkerboard Sauvignon Blanc 2012 poured alongside it. Cushman bookended the dinner with “Duck Liver Sushi,” a nugget of duck liver, seared, and sauced with a balsamic vinegar reduction infused with fermented cocoa. It was a mind-bending meeting of flavors, presented as dessert. 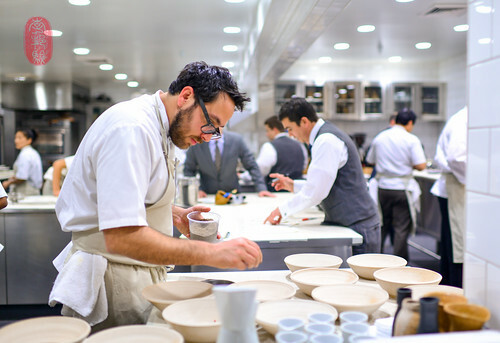 To match Cushman’s Japanese-inspired cooking, Kostow created a comforting bowl of vegetable “ramen,” with a tangle of “noodles” that were actually strips of king trumpet mushrooms. With the “noodles” was a “nori” chip made from sorrel. A warm dashi was poured over the lot, thickening as it mixed with the grated, smoked egg yolk in the bowl. Kostow also served super-tender quail, grilled on skewers and presented on a bed of shisho leaves with tissue-thin slices of pickled kohlrabi that I particularly liked with the Checkerboard “Kings Row” (85% Cabernet Sauvignon, the remainder divided between Petit Verdot and Cabernet Franc), 2009 vintage. 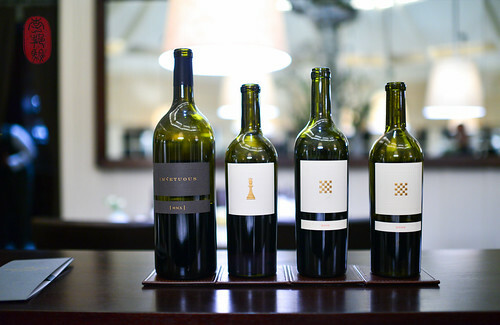 The entire menu from Tim Cushman’s dinner, with wine pairings by the guest vintner Checkerboard Vineyards, is below, along with a slideshow from the fourth day of Christmas at The Restaurant at Meadowood. If you would like to see the photos in a larger size, click through the slideshow to the Flickr album. Yuzu kosho, dashi mayonnaise, squid ink bubbles, Tokyo leek. Banana pepper purée, white truffle, black pepper, chive. Republic of Georgia sauce, dried spices. Ponzu, marinated watermelon, cucumber mignonette. Garlic, rosemary oil, sesame brittle. Chocolate, balsamic sauce, raisin, cocoa. 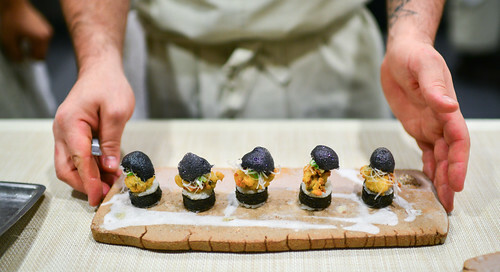 Photos: Tempura kumomoto oysters with sushi rice, yuzu kosho, dash mayonnaise, squid ink bubbles, and Tokyo leeks; Christopher Kostow plating; Tim Cushman at line-up. ~ by ulterior epicure on December 12, 2013.